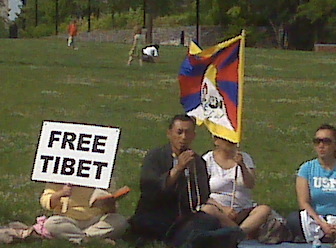 A couple of weekends ago, I got a call from my friend Al, informing me that there was some kind of Tibetan protest down at the National Constitution Center, and that they were doing some chanting he thought I might like to record. I had some time so I rolled down to see what was going on. I can’t really say I know much about the situation in Tibet, so for the purposes of this post, I’m not going to talk about the political significance of this event. When I got down there, I heard them before I saw them. A low drone perking up from beneath the din of city traffic. When I got to the National Constitution Center, there they were, sitting one after the other in a line facing the street, holding flags and chanting a harmonic drone that I found quite pleasing. They had a PA set up and two of them were chanting (maybe intoning is a better word?) what sounded like one base repetitive chant, with an improvised chant over it, but I’m just guessing. (If anyone knows what it is that they are chanting, I’d love to know.) They also had a stringed instrument, which they never ended up playing unfortunately for me. The group was fairly loud, but I knew I’d end up with lots of other stuff on my recording like the passing cars or idling trucks behind me. Not to mention the very high wind that day. So at some point I decided not to try to avoid any of that, but to allow it to in a way be an indeterminate instrument playing along with them. I’ve been fascinated recently with this kind of change of perspective that alters how one perceives sound. This had a great effect on my appreciation of this recording, when I finally encoded it. Instead of being annoyed at all of the sounds encroaching upon what I wanted to hear, I now can appreciate fully, all of the wonderful and mysterious background accompaniment that appears on this recording. And in many cases, it is quite wonderful. I especially like when my mic and the mics of the performers are both being overloaded by the wind at one point. – Tibetan Protest music vs. Market St.
You are currently browsing the OF SOUND MIND blog archives for June, 2008.